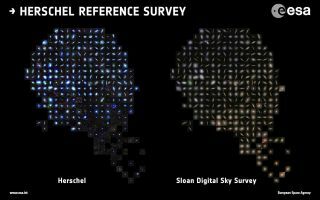 This space wallpaper is a collage of galaxies in the Herschel Reference Survey at infrared/submillimetre wavelengths by Herschel (left) and at visible wavelengths from the Sloan Digital Sky Survey (SDSS, right). This space wallpaper is a collage of galaxies in the Herschel Reference Survey at infrared/submillimetre wavelengths by Herschel (left) and at visible wavelengths from the Sloan Digital Sky Survey (SDSS, right). The Herschel image is colored with blue representing cold dust and red representing warm dust; the SDSS image shows young stars in blue and old stars in red. Together, the observations plot young, dust-rich spiral/irregular galaxies in the top left, with giant dust-poor elliptical galaxies in the bottom right.